It’s time to look at this iconic supplement again and see what we’ve learned about it since its inception and, more importantly, see if this old weapon still merits being a part of your dietary arsenal. 3 – Isn’t the weight gain from creatine mostly water? That being said, creatine does indeed cause cellular volumization and that’s an important determinant of protein breakdown and protein synthesis in skeletal muscle (and other cell types, too). Working out turns on protein synthesis while simultaneously breaking down protein, but creatine shifts the balance towards protein synthesis. Yes, creatine supplies an extra phosphate group to help regenerate ATP during high-intensity contractions, but cell volumization is an even more important cause of creatine’s muscle-building effect. Long-term use is a slightly different scenario because that’s when creatine increases fat-free mass without a concomitant increase in total body water. Muscle fiber diameter goes up, along with strength, so long-term effects appear to be caused largely by increased muscle mass. Not so much. It’s best used for intense, repetitive exercise that lasts less than 30 seconds, which pretty much describes weightlifting. 6 – Why doesn’t creatine work for everybody? Some people, especially big-time meat and fish eaters, already have an appreciable amount of creatine in their bodies and might not respond as well –their cells are already saturated with creatine. Others, like vegetarians who don’t get as much creatine in their diet, might have phenomenal results. 7 – What’s the best type of creatine to take? For a while it seemed like someone was introducing a new form of creatine every few months. You had creatine ethyl-ester, dicreatine malate, micronized creatine, effervescent creatine, and even a gummy-bear type creatine, among others. If imagination hadn’t dried up, we’d eventually have had beef jerky creatine or “I Can’t Believe It’s Not Creatine” creatine. 8 – What’s the best way to load creatine? Once you’ve loaded up, you only need to take 3 to 5 grams a day to maintain full capacity. True, there’s at least one study that showed you could forego the loading and just take 3 grams a day for 28 days, but it isn’t exactly clear if that low dosage increases exercise capacity. Granted, that technique will cause a surge of insulin that leads to an increase in glycogen in skeletal muscle, which might in turn result in an increase in cell volume, but taking it with carbs doesn’t necessarily cause the muscles to carry more creatine. There’s also been a decent amount of research that suggests the sodium might be more important to creatine transport than insulin, but it’s tricky since sodium uptake is mediated by insulin. Additionally, this dependence on sodium levels in the body might invalidate the age-old recommendation to take creatine after a workout. You of course lose a lot of sodium during a workout, so sodium levels aren’t going to be at optimum levels post-workout and that might affect creatine transport. You could of course address the sodium issue. Some users combine creatine with sodium bicarbonate to increase creatine transport. Of course, new thinking suggests there’s really no reason to use creatine pre-workout or post-workout, which would negate the potential sodium problem. Creatine actually works through saturation and not timing. As long as your muscles are filled with creatine, it’ll be there to help with your workout regardless of when you took it, be that in the morning sprinkled on your cornflakes, afternoon with your tea, or before bed. Likewise, there’s probably no real reason, once you’ve passed the 5 to 7-day loading protocol, to continue to take creatine with large doses of carbs. 10 – When’s the best time to take creatine? In case you skipped the previous question, it probably doesn’t matter when you take it. As long as you’ve followed the loading protocol and your cells are saturated with creatine, you don’t need to take subsequent dosages before or after your workout. Creatine doesn’t abide by the clock. Saturation (not timing) is what counts. The vast majority of the initial creatine studies were all done by dissolving creatine in coffee or tea, so no, caffeine doesn’t affect its absorption. As far as acidity, the acid levels of coffee, grape juice, and orange juice are all less than that of stomach acid, and creatine survives digestion completely intact. It sure seems to be safe. It’s been in limited use since the 60’s and widespread use since the 90’s. Sure, in the early days some people were worried about creatine causing or contributing to dehydration or rhabdomyolysis, but those myths have been long debunked. 14 – Is there anything I can do to maximize creatine’s effects? Given that one of creatine’s main effects is cell volumization, you need something to volumize the cells WITH, namely water. The general rule is to drink half your body weight in water, so if you’re a 200-pound dude, drink roughly 100 ounces of water a day. 15 – How soon will I know if creatine’s working for me? You’ll lose some of the fluid from your cells, which will of course reduce muscle volume, but you won’t lose any of the muscle you gained. A little bit. 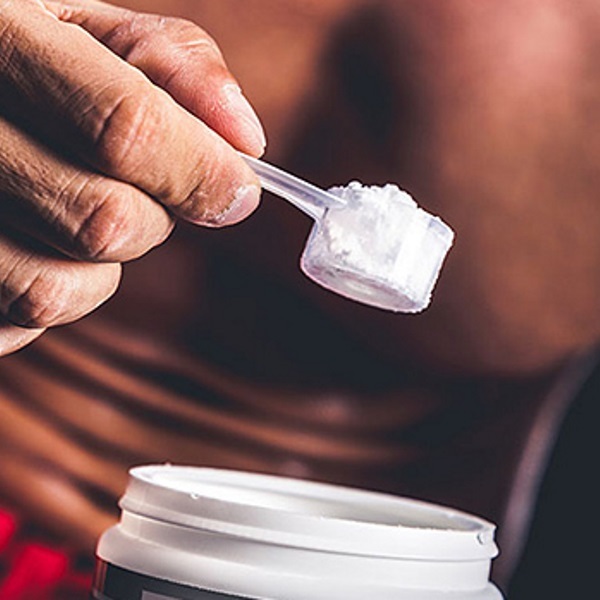 Creatine makes muscle bellies rounder, but it might blur some of your definition. Vain bastards might do well to just use creatine in the seasons of the year where they’re all bundled up and then stop using it during ab-baring summer. Of course, you’d have to be pretty damn ripped to begin with to notice this minor effect. 18 – Why did some weightlifters stop using creatine when it’s clearly so effective? Make sure it’s from a reputable company. Don’t buy the stuff in giant oil drum containers from drug stores or any warehouse clubs where you need a membership card and fat-lady navy-blue spandex pants to get in. Their stuff is likely adulterated or just plain low quality. If possible, look for something micronized. And good ol’ creatine monohydrate is really all you need.